Sweet potato pie is a Southern favorite and commonly found on the holiday dessert table. But it most often contains milk and butter, so it is not safe for those with dairy allergies. It also would not be acceptable as part of a kosher meal if meat was served as a main course. 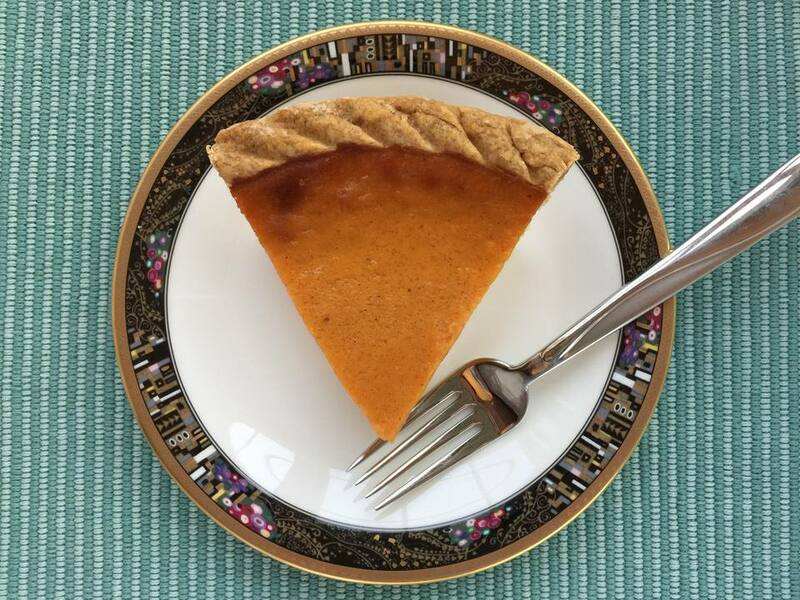 This sweet potato pie is dairy-free, substituting soy milk for regular and eliminating the butter. This pareve pie goes particularly well with turkey at Thanksgiving or any time of the year and is a nice alternative to kugel if you are looking for something new to serve for Shabbat lunch. Place sweet potatoes in a 4-quart pot with enough cold water to cover. Cover pot and bring to boil. Reduce heat and simmer potatoes until fork-tender, 20 to 30 minutes. Drain potatoes well. Use an electric mixer to beat the potatoes until smooth. Let the potatoes cool (you can refrigerate to speed up the process). Preheat oven to 350 F. Place pie crusts in pie plates or tins. Crimp the edges or use the tines of a fork to create a design. In a bowl, mix together the soy milk, sugar, eggs, and vanilla. Add to the potatoes. In a separate bowl, mix together the flour, cinnamon, and salt. Add to the potato mixture. Mix until smooth. Divide the sweet potato mixture evenly between the pie crusts. Level off the tops with a spatula. Bake pies for 45 to 50 minutes, or until a knife inserted into the centers come out clean. One of the secrets to the best sweet potato pie is choosing the sweetest potatoes possible. You obviously can't do this by tasting them in the supermarket, but examining them closely will give you a hint. Scrape off a little of the peel to reveal the potato flesh; you want a bright orange or even a dark red. Basically, the darker the flesh, the sweeter the potato. Instead of boiling the potatoes, you can bake them in a 450 F oven for 45 to 60 minutes, or until soft enough to mash with a fork. This pie is just perfect with a dollop of whipped cream, but to keep it dairy-free, serve with dairy-free whipped topping. If you won't be using both pies at once, or are making them ahead of time, you can freeze the pies for later. Wrap well in plastic wrap and then a layer of aluminum foil and place in the freezer. Remove several hours before and place in the refrigerator so the pie can defrost slowly; this will avoid any excess moisture. If you tell your kids it is pie and leave out the words "sweet potato," they are more likely to take that first bite. After that bite, they'll be hooked and you can talk as much as you like about the pie's ingredients.